If you are a leader in an organization, your employees are a lot like the luxury vehicle(s) you may have parked in your garage. Their performance is dependent on regular checkups and maintenance. If they break down, you go nowhere. It's hard to get ahead if you are constantly replacing them. Let's pretend for a moment that you own four different luxury vehicles and each vehicle takes a different type of fuel. Your sedan takes regular unleaded gas. Your hybrid takes unleaded fuel, while also powered by electricity. Your fourth luxury vehicle is 100 percent powered by electricity. I'm no mechanic, but common sense tells us that if you want top performance out of each of your four luxury vehicles, a good place to start would be to make sure you are fueling and powering each with the fuel and/or power they are designed to take. I mean, if you ignore the needs of your vehicles and try to use the wrong fuel or power, what results should you expect? Do you really have a right to get frustrated when you put diesel fuel in your hybrid and its performance is poor, or worse it doesn't run? What do you do then? Do you trade it in for another vehicle you hope will meet your performance expectations or do you figure out how to fuel it and power it correctly? Your employees are like your luxury vehicles. Forty years of research suggests you likely lead, manage and work with four different types of people. Like the four luxury vehicles outlined above, each type of person needs a different form of fuel. Failure to fuel people correctly will lead to poor performance and frustration. Success Skills Mastery is understanding the fuel needs of the people around you and giving them what they need. Your organization can have purpose and vision. Your strategic plan can be well developed with meaningful goals, plans, and processes. But, none of that matters without people to share your purpose, be inspired by your vision, and have the desire to achieve your goals. Take some time to think about different individuals you work with. What makes them valuable to your organization? What gives them security? What motivates them? How do they prefer to work? What is their decision-making process? What are their weaknesses? What stresses them out? How do they behave when stressed? How can you help them succeed? Fuel your people. Fulfill your vision! Part Two Preview: In part two I will talk about people who have a Driving Style. People with this Style are described as assertive and emotionally controlled. They are fast-paced, independent, and get things done. Who do you work with could be described this way? I look forward to sharing with you how you can work with and fuel people with a Driving Style to achieve maximum results in your pursuit toward success skills mastery. - Jason Kiesau, leadership and talent development manager with Aureon HR, writes about success skills. Please take a moment and think about two people in your life. Someone you work well with. Someone you work with who drives you nuts. Results-focused people tend to be task focused, less emotional and less relational. They tend to be more formal, less social and keep their personal and work lives separate. They are driven by results and making the right decision and prefer to avoid "fluff". In pursuit of getting their desired result, they can easily become impatient and frustrated with people who they perceive are not as focused and slow them down. Relationship-focused people tend to be people focused, relational and more emotional. This can be seen in their passion and enthusiasm when they are excited about something, as well with how they respond to things that frustrate them. They tend to be more informal, more social, and blend their personal and work lives. They are driven by the positive experiences they have with others and are most productive when they feel appreciated and liked. When they don't feel appreciated and harmony with the people around them they can easily take things too personally, impacting their motivation and productivity. Are you results focused or people focused? Earlier this year I worked with a top leader who is results focused and who was at his wits' end with a member of his team who is relationship focused. He didn't understand why she didn't just listen to him and why she overreacted about everything. When I talked with her I learned that his direct and cold demeanor made her feel like she was failing and she was starting to feel like she couldn't meet his expectations. At the end of the day, if this top leader wants to get his desired results, he needs to be more relational with her. He needs to show more appreciation and approval as he is giving her direction and expectations. She needs to manage her emotions better, stop taking things so personally and be more task focused. If you can relate to any of this, I challenge you to hit "reset" with the people who frustrate you and try to understand why they do. Also, in the spirit of self-management, understand why you are frustrated. Results-focused people do care about others; they just show it differently. Relationship-focused people do care about the results; they just need to know you have their back. People are different. We have different needs, preferred ways of doing things, weaknesses and things that stress us out. These dynamics don't have to create a workplace divide. To achieve success, we must get the best out of ourselves and the people around us. To do this, we must understand, respect and appreciate what everyone brings to the table in order to maximize everyone's potential together. Jason Kiesau is the leadership and talent development manager with Aureon HR, and the author of "FOCUSED - Your Future Starts Now!" and "Leading with Style for Senior Living Professionals." Connect with Jason on Facebook, Twitter and LinkedIn. 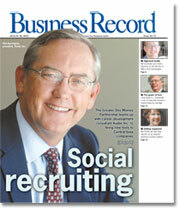 - Jason Kiesau, Leadership and Talent Development manager for Aureon HR, writes about success skills on IowaBiz.com. My name is Jason Kiesau and I am the Leadership and Talent Development Manager at Aureon HR, Inc. and author of FOCUSED – Your Future Starts Now! and Leading with Style for Senior Living Professionals. The role of our team at Merit is to provide to our clients’ leaders, managers, and workforce, the training, coaching and learning opportunities that support them in achieving their goals in alignment with their organizational goals. We believe this starts with what we like to call Success Skills Mastery. I’m on a mission to forever change the term “soft skills” to Success Skills, because without them you won’t succeed. It doesn’t matter if you are leader, manager, or an employee; you can be the smartest, most talented, and the hardest working person in the room, but if you lack Success Skills you will have limited success and will never fulfill your potential. Success Skills Mastery will be the subject I write about for IowaBiz.com. Regardless of what you do for your employer or what board you serve on, pursuing Success Skills Mastery will quickly raise your value and make you more effective; leading to greater success. Manage our attitudes, emotions, actions, and reactions and adapt them to people and situations as needed. Create win/win situations and build mutually beneficial relationships by understanding others’ needs and meeting them where they are. Understand strategic thinking and set and measure long- and short-term goals that align with our vision and strategic plan. I’ve been fascinated with personal, professional and leadership development since my early 20s. I am passionate about helping people live a high-quality of life by confidently pursuing and achieving meaningful results. Prior to joining Merit six years ago, I was a strategic partner with Profiles International helping clients hire the right people and a business coach with E-Myth Benchmark (now Benchmark Business Group) working with small business owners all over the United States, supporting them in achieving their strategic objective by working ON their business, not IN their business. Thank you for your time and attention in reading this. I look forward to contributing to IowaBiz.com and supporting your pursuit towards Success Skills Mastery! Please let me know if our Leadership and Talent Development Team at Aureon HR, Inc. can support you in achieving your goals.